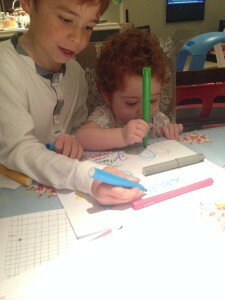 On Margot’s admittance to Great Ormond Street Hospital (GOSH), I began making notes and later wrote a private blog to try & keep track of what was happening. Below are excerpts from my blog, which provide an overview of Margot’s medical story, as it happened. Margot is being cared for by Great Ormond Street Hospital and initially spent 10 days in the Paediatric Intensive Care Unit (PICU), and then transferred to Elephant Ward on 17.10.13. From the outset, the medical team have advised us that Margot’s best chance of beating this blood cancer is a stem cell transplant/bone marrow transplant. Great Ormond Street Hospital is the UK’s largest paediatric centre for many services. The hospital is renowned for being one of the best facilities of it’s kind anywhere in the world. We take comfort from the fact that this is one of the very best places for Margot to be receiving specialist care and medical attention. Fortunately, Margot eventually found a suitable 9/10 HLA donor match and on Friday 21 February 2014, 140 days after first being diagnosed with leukaemia and following three courses of chemotherapy and a week of pre-bone marrow transplant chemotherapy, she received an infusion of bone marrow from a selfless, benevolent and anonymous 22 year old male German donor. 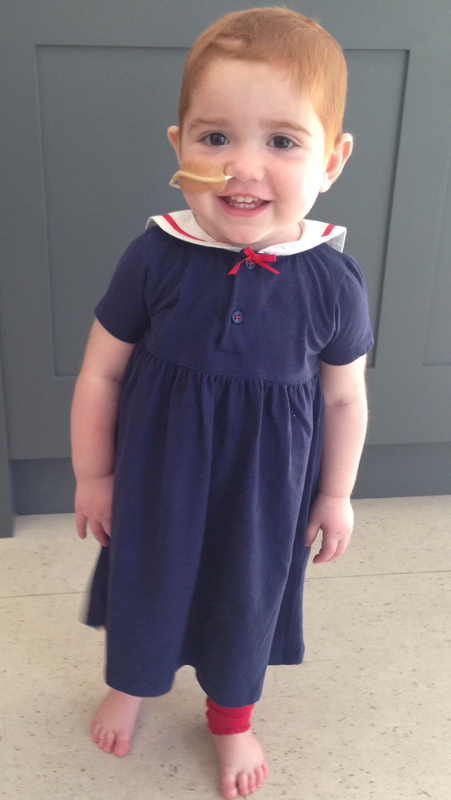 Margot has since had the number of medicines reduced and those that need to be maintained have been switched from IV to oral meds, so that we may care for her from home, maintaining regular visits from community nurses to our home and weekly day trips to Great Ormond Street Hospital. As I write, today is day 56 post bone marrow transplant and it’s just over a week since Margot left Great Ormond Street Hospital to come home. We now hope to have several quiet months ahead of us before Margot’s immune system really gets up to speed; during that time we need to be mindful of crowds of people and keep her progressing towards ‘normal’ feeding in an attempt to wean her off the need to retain the Naso Gastric Tube (NG tube) and the Hickman line, which permits intravenous administration of meds directly into her blood stream. This is yet another small but significant step along the long road to what we all hope will be a disease free and complication-free existence for Margot going forward. 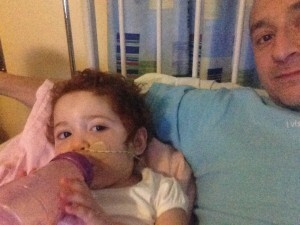 Margot underwent another bone marrow aspirate last week. Unfortunately, her Flow test results revealed a low residual level of the ALL (Acute Lymphoblastic Leukaemia) clone still present. The subsequent MRD test also confirmed the same: “a not insignificant but minimal level of the disease”. This is the original ALL clone returning – same chromosomes, same MRD profile, same surface markers. The AML (Acute Myeloid Leukaemia) clone is currently negative and the medical team at GOSH are not certain that the myeloid clone will also come back, but they now believe this to be “reasonably likely”. The first recommended course of action has been for us to stop the immune suppressant drug (ciclosporin) which we duly did on Friday evening. This will likely (and hopefully) trigger GVHD (Graft Versus Host Disease) which in itself is probably the best weapon against any remaining leukaemia cells; our hope is that Graft Versus Leukaemia (GVL) occurs and that the donor cells will destroy the remaining leukaemia cells. At the time of writing, there are no new signs of GVHD. We are continuing to monitor. Margot is scheduled to have another bone marrow aspirate on 24 June to re-test, following which a further assessment will be made. To compound matters, Margot also has a large load of the EBV virus; this means more tests at GOSH tomorrow, namely an ultrasound scan of Margot’s torso and also a chest X-ray (the EBV virus can mean enlarged lymph nodes). Thereafter, meds may be prescribed to combat the virus (likely to be Rituximab). The results that followed the 24 June bone marrow aspirate reflected the initial concerns. The ALL clone of the disease is present and at 1%, up slightly from when it was initially detected. 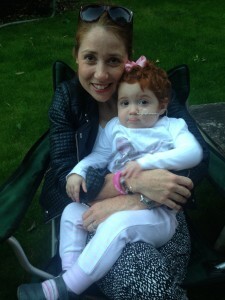 Margot’s next bone marrow aspirate is on Friday 18 July 2014. The resultant tests will reveal whether any Graft Versus Leukaemia (GVL) has taken effect (there is a chance that the donor cells could dispatch the leukaemia cells) and it will also inform us as to the status of the disease. 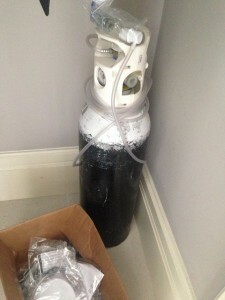 In terms of treatment, we are in a holding pattern until then. 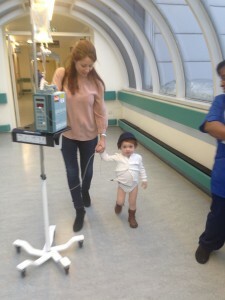 Great Ormond Street Hospital say that conventionally, Margot is incurable. Our choices are now whether to pursue experimental therapies or symptom care. We are currently exploring & considering experimental therapies so that we can make a risk assessment and quality of life judgement. Ultimately, this of course comes down to little more than a feeling. By far the most favoured experimental route is a medical study at the Childrens Hospital of Philadelphia (CHOP) – see video link. Whether this gene therapy treatment offers a curative approach or perhaps a bridge to a second bone marrow transplant is unclear, however in principle and without the benefit of more information, we currently feel that we would rather try than submit to the disease. We hope that Margot will be deemed eligible for this study and that we will have the opportunity to consult with the medical team at CHOP. Unfortunately, we received some bad news on Friday. Whilst the peripheral blood counts are still OK, the two completed bone marrow tests now show 84% blasts (leukaemia cells) using the microscope and 63% in the FLOW test ie the disease has progressed from 1% three weeks ago to somewhere between 60-80%. What these results tell us is that the leukaemia is extremely aggressive and it has progressed quicker than any of us anticipated. Our understanding is that leukaemia grows exponentially, so time is not our friend. 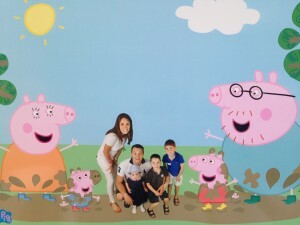 Yesterday we headed off to Peppa Pig World (click image for short VIDEO). Margot is a huge fan. As we drove home, Rufus described it as “the best day ever”. One consolation is that the AML clone apparently isn’t present. Has the GVHD successfully dispatched the AML component ? We have another meeting with the medical team tomorrow to discuss the options in person. We quickly need to make a decision on what action to take next. We have a rapidly shrinking list of options available to us. And none of them sound encouraging. We also need to establish why CHOP isn’t regarded as a viable option any longer. It’s all so confusing and difficult to comprehend because Margot looks and is behaving perfectly normally. The inference, which I may have missed on the call with the doctor, is that he believes we are on a hiding to nothing and that the disease dictates that we are almost out of time. And that in itself, limits our options. 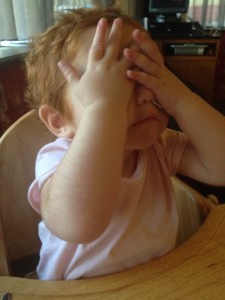 The last six days have been very testing for all the family. Vicki & I have had to consider some dreadful scenario’s and make some very tough calls. We have been told by CHOP that it’s CAR T-cell therapy is not an immediate option until perhaps the end of this year. And there has been further disease progression: as of Thursday, tests show that there is now c.10% of the disease in Margot’s blood and her marrow is almost 90% leukaemic. We have had to decide quickly on what to do next and have chosen to hang on to hope. BiTE (Bi-specific T-cell Engagers), A.K.A. Blinatumomab is the experimental therapy we have been steered towards. This has a 30% success rate of bringing the ALL disease back into remission. BiTE is very much regarded as a ‘bridge’ to a later treatment. 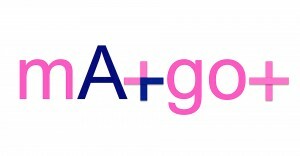 Blinatumomab is not a drug as such, but an antibody. It does something similar to T-cell therapy in that it recruits donor T-cells. Subsequent treatment could perhaps include CART in CHOP (if we have sufficient time) or a second bone marrow transplant, if we can achieve remission for long enough such that this option is considered sufficiently safe. We are heading for Sheffield Children’s Hospital tomorrow for treatment to begin first thing on Monday morning. Sheffield is the centre that has been running the study and are best able to treat Margot during it’s administration. 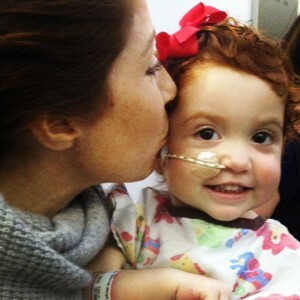 The initial treatment is for a month, 10 days as an inpatient and then the rest of the month as an outpatient, with Margot needing to wear a small pump that continuously administers the antibodies. Margot is being granted access to this treatment on compassionate grounds and will be the first person to receive it outside their study. 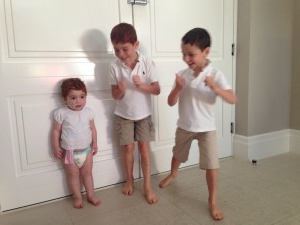 It’s very difficult to know whether we are making the right decision for Margot. We don’t want her to suffer. However, the alternative is to surrender to the disease. We know that Margot’s platelets have fallen significantly over the last 11 days and whilst she is still clinically well, Margot vomited yesterday and it is only a matter of time before she becomes symptomatic and very unwell. We are told to expect a fairly immediate response to the BiTE treatment, probably within the first 48 – 72 hours. Heaven help Margot and the rest of us. Indications are that the BiTE treatment is potentially working; if successful, the disease will be brought back into remission, but this treatment is to be regarded as a ‘bridge’ to a further treatment (possibly at CHOP or a second bone marrow transplant) rather than a curative approach. Margot had an adverse reaction to the initial infusion of the Blinatumomab which was what the Professor wanted to see. 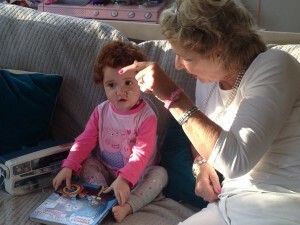 A reaction is required for the treatment to work, so Margot’s reaction was positive (albeit difficult to experience). That’s the theory ! And on that basis, so far so good. As to actual progress and whether this experimental treatment is practically working, we cannot yet tell by analysing the peripheral blood counts alone because whilst Margot was poorly, Dex steroids were administered and this interferes with the blood analysis. The Dex could have been the reason for some positive signs in Margot’s blood numbers. However, Dex cannot affect the marrow, so the only certain way to tell whether the blina treatment is working will be when Margot has her next bone marrow aspirate on Thursday. Following that bone marrow aspirate test, we will return to London on Thursday. The big question is whether we come back to London with the Blinatumomab infusion on pump, or without it. In the meantime, we have some time together away from the hospital over the weekend, as a family. All being well, Margot is to return to Sheffield Children’s Hospital as an inpatient on Monday morning and we are told to expect potentially more adverse reactions thereafter, once the dose of Blinatumomab is increased (which is all part of the protocol). Consequently, we will be on WATCH again for another 48 hours from Monday morning. Thankfully, it’s been an uneventful few days on the medical front. The dose of experimental medication was duly increased yesterday morning and at the time of writing, we are pleased to report that Margot hasn’t suffered any further adverse reactions. 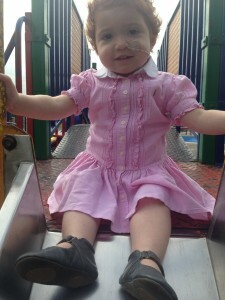 On Thursday Margot will undergo another bone marrow aspirate procedure so that a sample of her marrow can be tested. These tests will be critical : they will verify whether the BiTE experimental treatment is effective in bringing the ALL clone into remission. And they will also seek to establish whether there is any clear evidence of the AML component of her disease. If successful, this treatment will give us more time and hopefully serve as a ‘bridge’ to further treatment, still in pursuit of a curative approach. In short, we will have a better idea of ‘what next’ after Thursday. We are looking forward to returning home this week and to reuniting the family again. Vicki & I met the Professor at Sheffield Children’s Hospital earlier this afternoon, following Margot’s bone marrow aspirate this morning. Unfortunately, neither of these wishes have come through. There hasn’t been any noticeable response in the marrow to the BiTE therapy and the impression the Professor got from the microscope test is that the AML component looks to be present, albeit less than 5%. The more sensitive MRD test is being undertaken by Great Ormond Street Hospital (GOSH) and we anticipate they will probably have these results by close of play tomorrow. In the background, we have been considering other experimental therapies in the hope that there might still be a curative approach for Margot. That said, GOSH have already suggested that we ought to consider palliative care if the AML clone returns. We now need to digest this latest information and are going to consult further, to help us decide next steps. 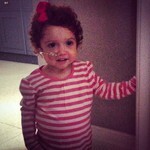 We visit GOSH to meet Margot’s consultant, as arranged on Thursday evening. 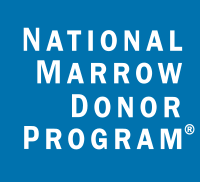 The MRD (Minimum Residual Disease) test results following Margots latest bone marrow aspirate confirm that it’s still mainly the lymphoid clone present (ALL) but also that there’s a low level myeloid (AML) present as well. On further interrogation the doctor waves away my questions and tells me that the actual levels themselves are now academic. The point is that the myeloid (AML) is there. The return of the myeloid component means that CART therapy (the Philadelphia option) is now out of the question. CART is only able to address the ALL clone. It also appears to mean that there are no more sensible options left for us to consider. So I enquire about other experimental therapies that we have been researching. Some are very early stage. The advice is now very clear: our efforts in that direction would most probably be futile. The doctor suggests that the next few weeks are likely to be Margot’s “best weeks” and potentially symptom light. He refers to how best we might spend that time and outlines what we might expect from a Phase I trial. It does sound very much like the Phase I study we have been looking at has only recently moved from ‘lab rat’ to ‘human guinea pig’ status. Literally. It’s the quality of life discussion again. He is being compassionate. So where to draw the line ? That said, I’m having it because I would rather us feel somewhat prepared and aware of what this is all about than to find ourselves suddenly broadsided by a situation and to later feel robbed of perhaps not having had the opportunity to do x y or z because we were woefully unprepared & in the dark. I am trying to convince myself that within the scope of this conversation, at least we still have some choices, even though the choices open to us are now far fewer, less good & seemingly don’t include a curative approach. She goes on to explain that calling it “symptom management” is a better way of explaining what she and the team do. Symptom management is one part of the palliative care approach: physical & psychological care for the patient. It is not instead of active treatment, but rather can be alongside active treatment. 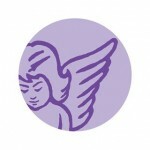 Their aim is to keep the child as well as possible, for as long as possible, with as normal a life as possible. Hearing her say this makes me a feel slightly more comfortable, not least because this is completely aligned with how every parent goes about everyday normal life, caring for their children. 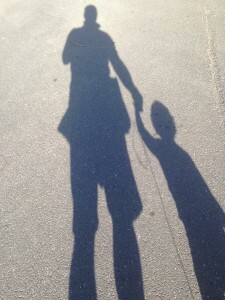 The obvious difference is that ordinarily, our children are expected to live full lives. The conversation ventures into the consideration of whether we ultimately wish to plan for Margot to be cared for at home or in a hospice. It’s all deeply upsetting. 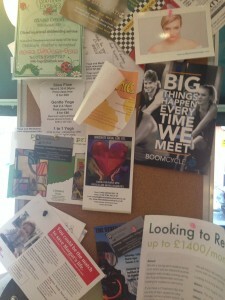 It’s suggested that we might think about going to visit a local hospice. We leave to go away and think it through. They suggest we take a couple of weeks. It’s been an exhausting day emotionally and we leave GOSH and head for the cafe opposite to grab a coffee and a bite to eat before heading home. Vicki and I made a decision last night, after a long conference call with my two cousins, both cancer doctors and one of them a specialist transplant physician. They endorse the advice we have already received from Great Ormond Street Hospital and tell us that having followed Margot’s journey closely since diagnosis, the care Margot has received has been flawless. 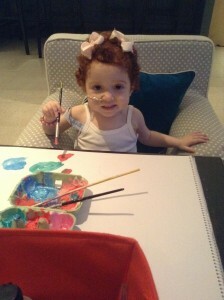 We want the best quality of life for Margot with what little time we have left. So we have made that decision overruling the instinct to fight against slim odds. We don’t want Margot to suffer unnecessarily, least of all for our own sake to somehow make us or others feel better. We also need to tend to and care for the rest of the family, so are now working towards making a proper plan to ensure we are best equipped to deal with issues arising with the boys. Generally Margot has been clinically well over the last few weeks, although she had a rough weekend after starting a course of chemotherapy on Friday. This was an attempt to try and reign back her rapidly rising white cell count; however, it made her unwell and only had limited (if any) success. Since we stopped administering the chemotherapy Margot has been feeling better although she is increasingly more sleepy as the disease progresses. The plan for today was for us to visit Great Ormond Street Hospital for a lumbar puncture procedure. This is all part of the symptom management process and the aim is to inject chemotherapy into her spinal fluid; we don’t want any leukaemia getting into Margot’s Central Nervous System – there is a tendency for this to happen as white cell counts rise above 50. If this were to occur, symptom management would become far more challenging. 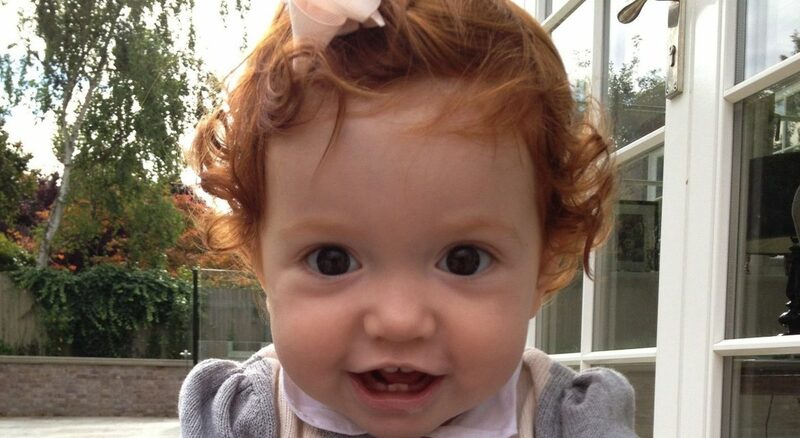 As of yesterday, Margot’s white cell count was recorded at 53.6. Unfortunately, Margot’s temperature spiked & she vomited during the early hours of this morning, so the lumbar procedure needs to be rescheduled and we currently find ourselves at Kingston Hospital instead. 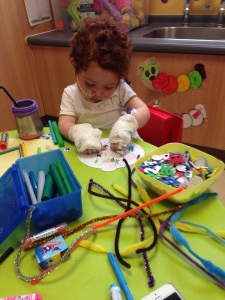 We hope to return home later today, which is where we are continuing to care for Margot. We are working with the palliative care team to try and manage her pain to ensure that she is as comfortable as possible and infection free (she is severely immune suppressed). These are extremely difficult times for Margot and the rest of our family and we are so grateful for your continued support and well wishes. An awful 11 days for Margot. 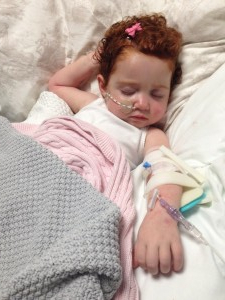 She suffered constant temperature spikes and rigors at home for a week, until being admitted to Kingston Hospital after tests showed that she had a line infection (her blood cultures were all negative during the first week of fevers). Given that Margot has no immune system, any infection is life threatening. Last night, Margot was in extremely poor condition and for several hours her vital signs were weak and it seemed very likely that we would lose her. Margot fought back against the infection and managed to survive the night. We are told to expect more ‘ups and downs’ – mercifully today has been a quieter, more stable day. We are now bracing ourselves for another uncertain night. We wish to thank everyone at both Great Ormond Street & Kingston Hospitals for all their efforts in helping to keep Margot as comfortable as possible during this horrid time. Margot has had a reasonably stable 24 hours. She is still having ‘ups and downs’ but in the scheme of things, her current condition is immeasurably better than it was on Saturday night. We are hopeful that tomorrow Margot will be well enough to leave Kingston Hospital and return home. Earlier tonight we received an unexpected email from the consultant haematologist at Great Ormond Street Hospital. His email potentially provides an answer to a recent query which has hitherto gone unanswered, namely: why are Margot’s white cells remaining low and static ? “We have looked at the cells from last week’s sample and only half are ALL cells, a small proportion crossing towards the AML clone, but the bulk of the rest are normal looking reactive cells – presumably of donor origin – we are trying to prove. 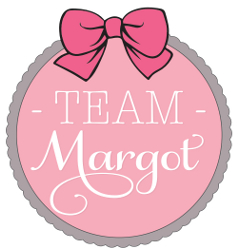 Margot’s condition is itself extremely rare, so we’re not strangers to longshots ! Frankly, we are holding out for a miracle and perhaps the donor cells might just provide one after all. 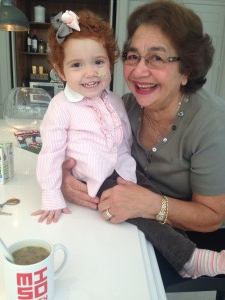 So, without getting carried away – until someone can show us that there is no immune response to the leukaemia, or indeed Margot tells us herself, I’m allowing myself to believe that Margot may have started a slow recovery. As I watch Margot pottering around tonight, I pause to take stock and do a little review. Of course, Margot is very sick; conventional wisdom dictates that she’s incurable and she’s under palliative care. And we have had to accept where we are: Margot is in a fragile state. 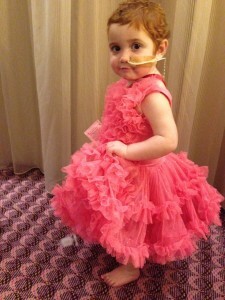 She has leukaemic blasts in her blood and marrow and currently has no immune system and is vulnerable to infection. That’s what we know from the various tests. However, to look at her, Margot is nevertheless in good form and functioning well. Tonight she looks well and is happily playing. She doesn’t look sick, but then this has been a ‘Margot trait’ ever since she was diagnosed – she confounds the medics expectation of how she ought to be, given “the numbers”. That’s basically what doctors do – they look at the file which helps them start to form an expectation and then they stand back and look at the patient to complete their opinion. And whilst I also accept that I may have grown too conditioned to caring for a sick patient and so now fail to see straight (I might well want it so much that I am deluding myself) I don’t see Margot deteriorating; rather I see her making slow yet steady improvements, punctuated by short periods of tiredness and fever. On 21 September, we saw Margot fighting against infection and I recall thinking that if she could overcome that infection, then we would be back to where we were before the fevers set in – back home, tutu racing. And broadly, that’s where we find ourselves now, albeit with a once a day fever. 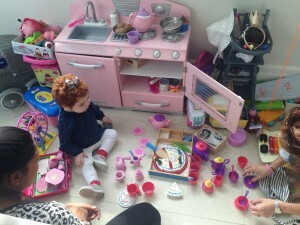 There are the usual toddler advancements in speech and behaviour, yet I also see slight improvements in her appetite and well being in addition. What sticks in my mind is Dr Renee telling us that two things will likely kill Margot: bone marrow failure or infection. If bone marrow failure is just around the corner, then I really don’t see any signs of this occurring, unless it just suddenly happens. Inexplicably, the white cell count is down (for now), donor cells are on the rise and the missing piece of the jigsaw is confirmation of what’s going on in the marrow. 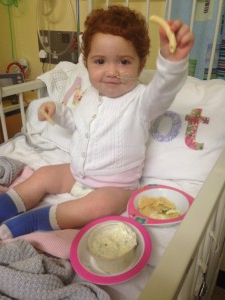 On that point, we know that Margot isn’t creating neutrophils – they’ve been at 0.00 for weeks. She’s not creating platelets nor red cells either, so we must accept that her marrow is compromised and malfunctioning. But to what extent ? 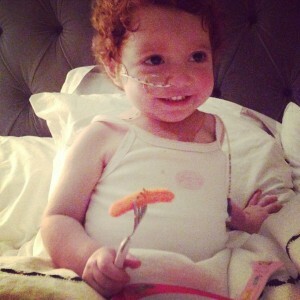 It isn’t completely shot: Margot is still receiving and holding platelets and red cells. And IF there is a genuine immune response underway and Margot’s donor cells are indeed fighting the disease, then that WILL make her tired and it WILL see her spike temperatures and fevers. How it has come about remains unknown, but this theory is actually a plausible explanation for her current state & condition. My question is whether this is a sustainable recovery that could see her make a full recovery, or a “false dawn”. So to my mind, all is not yet lost. And I’m still holding onto hope. “Only in the darkness can you see the stars”. 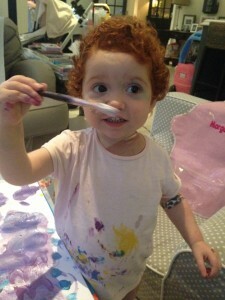 Margot’s bone marrow aspirate procedure earlier this week & the subsequent marrow test proved disappointing. In the event, it was not a good day after all. The initial marrow test has revealed leukaemic blasts in about 95% of her marrow – which is effectively what the doctors expected to see. And to compound matters, blood culture results back that day also confirmed that Margot’s line infection remains, so she didn’t come home on Tuesday and instead remains at GOSH on IV antibiotics, pending another operation. This is the same pseudomonas infection that we were hoping had been dispatched by 10 days of IV antibiotics. The pseudomonas is “stuck” to Margot’s Hickman line (which is the semi-permanent line into her chest), so the plan is to remove the infected line and for temporary cannulas to be put in place whilst she is under general anaesthetic. The cannulas will permit regular access for blood and also enable Margot to continue to receive IV antibiotics for a few more days, post removal of the Hickman line. We want to ensure that the pseudomonas bug is eradicated once and for all, following which Margot can have another operation to insert a new line (probably a portacath aka a ‘port’). The port is an alternative line which sits under the skin and enables easy & regular blood access. For now, Margot is back on Elephant Ward where she is wrestling with temperature spikes & fevers. We are hoping that she will get a slot in theatre today so that the infected line can be removed and that Margot will again be able to overcome this life threatening infection. Margot eventually had her infected Hickman line removed on Thursday evening (9 October) and two temporary cannulas were fitted whilst she was under general anaesthetic, one to each of her hands. The 4 times daily courses of IV antibiotics are to continue until the middle of next week to ensure that the pseudomonas infection is eradicated, but since the removal of her Hickman line Margot hasn’t spiked a temperature, which is a good sign. We held back from giving her one of the scheduled & regular paracetamol doses earlier this afternoon to see how she would cope and thus far Margot appears to be holding up well without it. Earlier today, both cannulas failed and had to be removed. Eventually, at past 22:00 tonight a new cannula was fitted and now appears to be working well. Bloods taken for testing and IV antibiotics running. Margot was very brave but is exhausted. The next step is for Margot to undergo a further operation on Monday to install a new central line (a port) into her chest and hopefully we will be able to return home on Tuesday, all being well. 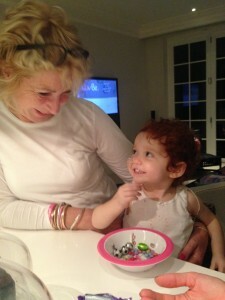 Earlier this evening, Margot was in good spirits and we had a father / daughter “moment” (click here for short video). Thursday’s blood results were not very encouraging, however the fact remains that there isn’t anything more that we can do, other than continue to take one day at a time and seek to make the best decisions we can, as we go. For now, we need to wait for the current situation to settle and then review again early next week. Margot had a new central line (a portacath) installed; we hope the IV antibiotics will help Margot overcome her recent infection and that she will be well enough to leave hospital & return home from GOSH tomorrow. More bad news : the latest test results reveal that there is a large amount of pseudomonas in Margot’s blood and in her stool. It’s also in her marrow – frankly, it’s everywhere. This is the same particularly nasty bug that we hoped would be treated by IV antibiotics; however, Margot’s bone marrow is unable to help fight the infection and the antibiotics cannot do the work on it’s own. Apparently, Margot will become increasingly tired and her blood pressure will fall, along with her other vital signs. Bottom line is : this life threatening pseudomonas bug is gathering momentum and Margot can’t seem to clear it. We are told that Margot is now beyond rescue and that it’s no longer a matter of the place of care, but the place of death. Margot is to remain at home where we are keeping her as comfortable as possible. Thank you for your prayers, positivity, well wishes and support. Margot takes a short walk around the house earlier this morning. Increasingly, she is weak & tired but mercifully we appear to have her pain management under control. At 10:24 this morning, our dear little daughter, Margot passed away at home. She died peacefully and was surrounded by those who love her.